From left to right are Elizabeth Altieri ’11, Brett Wolf ’05, Erica Standish ’10, Don Stubblebine ’95, Madeline Young ’13 and Jessica Stetson ’15 at the Hilton Garden Inn in Rochester. Whether people are staying overnight at Rochester’s new Hilton Garden Inn or dining at Grappa, they likely will be served by at least one RIT graduate. 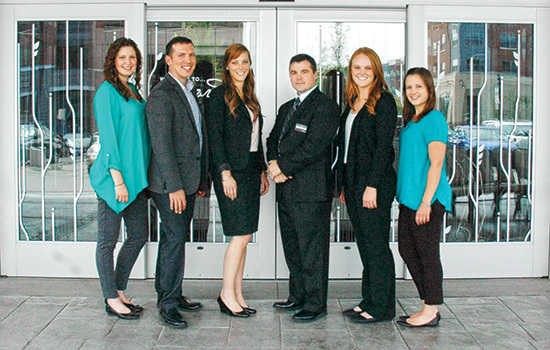 The group of six hospitality majors, Don Stubblebine ’95, Erica Standish ’10, Elizabeth Altieri ’11, Brett Wolf ’05, Madeline Young ’13 and Jessica Stetson ’15, is working together at the Hilton Garden Inn that opened last June in Rochester’s College Town complex near the University of Rochester. Although the graduates are a part of the same company, they encompass a wide range of roles. Stubblebine, hotel general manager, is responsible for the hotel and restaurant. Wolf, housekeeping manager, and Young, operations and sales assistant, work in the hotel. Standish, food and beverage director; Altieri, restaurant and bar manager; and Stetson, banquet manager, run Grappa, the Italian restaurant, and banquets. Prior to the new hotel, Stubblebine, Standish, Wolf and Young worked at the Courtyard Marriott in Brighton, N.Y., owned by the DelMonte Hotel Group. The corporation also owns the Hilton Garden Inn. Stubblebine has managed several local hotels for the corporation but opening a customized hotel was a new experience for him. Due to the extensive food and beverage operation, he has to reach many goals, and ranking No. 1 is at the top of his list. Standish works every day in the upscale Italian restaurant to educate guests about the selection of grappas and modern cuisine they offer. “Getting the word out about the 30 different Italian grappas we serve and the different ways the spirit can be used are my main goals for the restaurant,” Standish said. Grappa is made from grape pomace, the seeds, pulp and stem leftover from winemaking, and distilled into a high proof spirit. The spirit aids with digestion and pairs well with dessert and coffee. While the spirit is typically consumed after dinner, it can also be mixed in cocktails and used to make butter. In addition to grappas, the restaurant serves Italian Nouveau cuisine, a variety of classic Italian dishes with a modern twist. The modern cuisine has received positive feedback from guests. To continue providing the latest food and beverage trends, Standish plans to develop new cocktails and entrees.